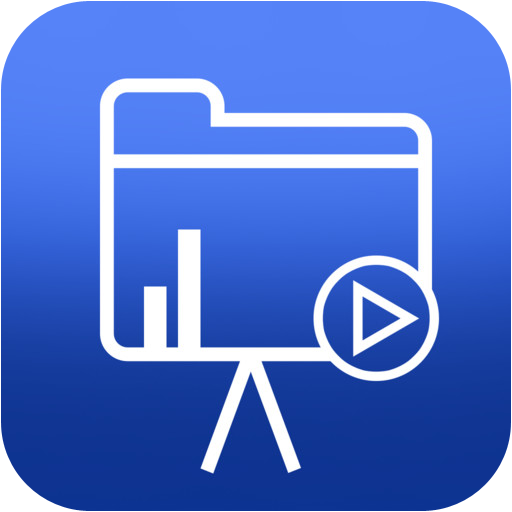 This App allows you to prepare a slideshow presentation on an iPad, without the need for anything else (apart from the information, of course). Your presentation stars springing to life by pressing the + icon. Now either pick one of the built-in templates, or take a photograph from within the App, to get a background. You can also use your photo album where each selected one will be used a slide (a different kind of presentation but, could be very useful). Next, press the Text editor icon to enter some text on your slide. As one has become accustomed, the text can be moved, resized, and coloured. Then do this as many times as needed to create your set of slides. If this a presentation where you will not be present, you can record a voice-over directly in the App. You can also add Music from the built-in library, or from your own music library. All that remains now is to set the speed by using the slider towards the screen and then press Create Presentation; your work will be saved to the photo album in the App, ready for sharing. This is a low-cost $1 App; excellent value. If you need to make presentations, and especially if you don't get too much notice, this could be just what you've been looking for. The App only works on an iPad. The App only seems to support text that is left aligned. Presentations can be shared via e-mail, as well as Facebook and YouTube; as ever, be careful of what you share. If you are using music from your library, be aware of any copyright issues. Prepare presentations on the fly. You can get WiPoint here and support for the App here.